And it grew and grew and GREW… I’d never seen anything like it. It seemed like a plant possessed, a real go-getter, if you will. From a small (if energetic) sprout in the early summer, it grew into something much more like a tree by the beginning of fall, towering over the gate and providing an area of unexpected shade and relief from the sun. I bought a bench and placed it underneath, creating a reading area in the new island of cool. Along its long graceful branches blossomed hundreds of small cheery yellow, trumpet-like flowers . If I sat still under it long enough I was surrounded by a stream of hummingbirds, chirping and darting in to take advantage of the flowers. I was surprised by my (not so little) over-achiever and more than a little mystified. Where did this plant of herculean vigor come from? What leant it the almost bionic skill, the ability to be “better, faster, stronger” than the other plants surrounding it? A fruitless search on the internet was cut short by a discovery outside the realms of “da interwebs”. During a field trip for a Natural Resources class I was taking, the identity of our mystery plant was revealed, and the unveiling wasn’t entirely a pleasant one. Our little guest was technically more of an invader- Nicotiana glauca, otherwise known as tree tobacco. A native to Bolivia and Argentina, this aggressive plant had little to no competition in the area and easily towered over the local shrubs. According to invasive.org and several other websites, “ Wild tobacco is a highly invasive opportunistic weed, and easily out-competes natural vegetation in regrowth or disturbed areas. It is also thought to be toxic to livestock if eaten in sufficient quantities”. It is a “tall shrub or small tree in the nightshade family (Solanaceae, of family that contains potatoes and tomatoes) with pendulous tubular yellow flowers an inch or more long. The oval leaves are 2 to 8 inches long with a waxy grayish covering. It is a rather weedy plant, yet somewhat attractive, especially to hummingbirds.” The seeds of this plant are eaten and spread long distances by birds. My shady, graceful, flower covered Tree Tobacco is apparently pure poison. It is on the list of toxic plants in several states, including Texas, California, and North Carolina. To enhance the spiritual experience, tree tobacco is sometimes smoked by California Native Americans in combination with Datura wrightii, which may be dangerous as both plants induce respiratory depression. 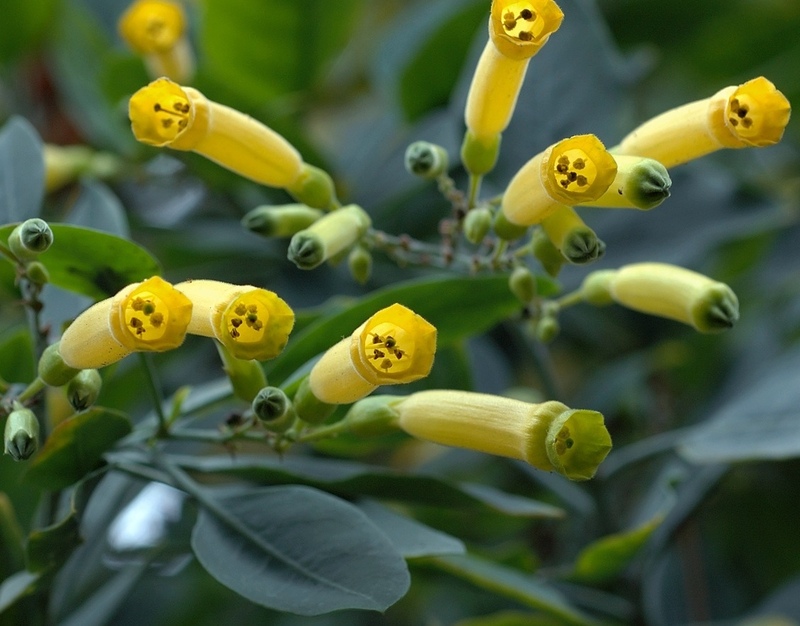 “Although Nicotiana glauca has been publicized as a safe, hallucinogenic plant on some internet websites, smoking or ingesting the plant has frequently lead to death and parents are encouraged to keep the plant’s leaves and stems out of the reach of their offspring, for fear of accidental death.” Say what?! In addition to this damning testimony, our professor contributed another volley of condemnation: the plant was one of the worst invasive offenders- extracting water from the soil at a frightening rate and transpiring it away into the atmosphere- effectively desiccating the soil around it while at the same time outcompeting local shrubs and trees and displacing them. A healthy ecosystem is composed of a complex set of interdependencies between its members that has developed over time. This set of relationships should be in cyclical flux over time. The introduction of a new invasive species (like my Tree Tobacco) can and will change this set of interdependencies- and affect far more than just a single plant or animal that is “replaced”. Even in situations where the invasive does not cause a breakdown of the entire local ecosystem it still leaves the system highly vulnerable to a breakdown. As a genetic monoculture spreads over an ever-greater region, wiping out the specifically adapted individual species, the entire ecosystem becomes more vulnerable to an assortment of pathogens that can spread quickly and broadly through the population. Now the dilemma. Do I heartlessly uproot this interloper? Or would it turn out to have some redeeming qualities? I had watched it grow for an entire summer, nursed it along sometimes, to tell the truth, with extra soaks from the watering can to support its ever-spreading canopy. Now I had to decide if I should tear it from the very ground of my garden and cast it out- a modern day Bible story reenacted. Further research only muddied the issue… It seems that this noxious, sometimes deadly, aggressive ‘weed’ is also often used in decorative gardening as a way to attract hummingbirds to the garden. In “Hummingbird gardens” by Nancy L. Newfield, it is earmarked as a “very choice” plant species particularly suited for attracting our little darting feathered friends. And there was the delicious shade it had so quickly and temptingly provided in my otherwise searingly arid ‘gardenscape’. Now that I knew the identity of my uninvited guest, I saw his relatives everywhere. Along the roadsides, in drainage ditches and even dominating a corner of the occasional garden. In our class we had learned how to efficiently uproot these invaders. With saw, root wrench and shovels, we had eagerly applied ourselves to the task- removing dozens of trees from the bottom of a clogged up riverbed near Irvine Ranch. Finally, it was the very abundance of the plants that decided me. If I could slow the invasive tide and it’s consequences that much more by removing my one tree, then it would be worth it. One morning, with a sad heart and a heavy shovel, I set out to cleanse my garden of this exotic invader. Next year I’ll plant a native shrub in its place… but I have to admit, I’ll miss Nicotiana glauca’s graceful branches and yellow flowers in my garden. I live in a rural area that has about the same amazingly fire resistant properties as fluffy cotton ball tinder- on a hot, dry day…. with a butane torch held under it for good measure. Our family ranch in Sage (on Sage Rd) is surrounded by large amounts of dry Sagebrush, dry chaparral, oaks (with dry leaves), occasional pines (with dry needles) and dry debris, with plenty of dry invasive grasses to add extra oomph to the potential conflagration. (Bonus! Now with more fuel!) This leads to conditions that might be generally described as “you’re f*^#ed!” when fire season comes around. We pretty much know each of the local firemen by name. We’ve run the fire prevention gamut: prescribed burns, backfires, helicopters dropping water and retardant in wide swathes like graffiti from giant orange spraycans across the land. Each time a backfire or prescribed burn is suggested, my heart drops down into my stomach and panicked thoughts run through my head; what about the safety of the process? The possible risk to land and home? Will the animals make it out alright if something goes wrong? Will we? Our family homesteaded this land. That’s pretty uncommon in California, with its big box stores, strip malls and cookie cutter houses. Here everything is new- anything over 10 years is considered dated. 20 is old and venerable and fifty is practically enshrined as ancient. Our family has lived here for over a century and a half. Most of the houses and structures are well over 100 years old and have housed several generations. That may not seem like too long on, say an evolutionary scale, but it’s plenty long enough to grow more than slightly invested and attached. Every time a fire passes nearby a chill runs down my spine. The suggestion of purposely setting a fire as a preventative measure makes me nervous- even if I see the necessity. Several years ago, 3 adventurously dumb kids with motor bikes and a desire to avoid boredom in the most destructive way possible set a fire (by mistake, one sincerely hopes) near our property. The blaze proceeded to burn a large section along our Northwest flank, leaving the land resembling an unhealthy bald patch on a mangy dog. Later next year, a much larger fire swept through the area again (not an odd occurrence in an area where we have a fifth season- Fire season), ravaging much of the land to our Northwest. We watched from (relative) safety as the fire block provided by the accidental “prescribed burn” from the year before protected our house, leaving us in a little island of our own. Breathing in the air heavy with smoke particles (some of them so large I could swear that I could feel them rolling grittily down my throat and into my lungs…) Oddly enough, despite feeling a bit sick to the stomach and having a pounding headache from the smoke, I ended that day feeling rather good. Our home wasn’t a crisply charred black charcoal shell, my garden with its bounty of luscious tomatoes was still there, the old butchering oak and hammock with the view of Mt. San Jacinto still stood in place, swaying in the breeze. I know that there are many obstacles that fire managers face when using fire as a management tool- The unpredictability of wind and weather, the issue of obtaining enough funding and crew with experience necessary to carry out the job, the need to make extremely quick decisions concerning millions of dollars of property and human lives that will later be judged by the general public are just some of the difficulties in fire prevention and prescribed burning. I’ve been in this situation myself, and even though my heart was pounding the entire time and my stomach does flip flops until the last flames die down, I have been more than happy with the results. Thank you, Sage volunteer fire crew. Gayatri Mantra: Chant Your Heart Out! Kids Activities: Yucca Uses: making soap!